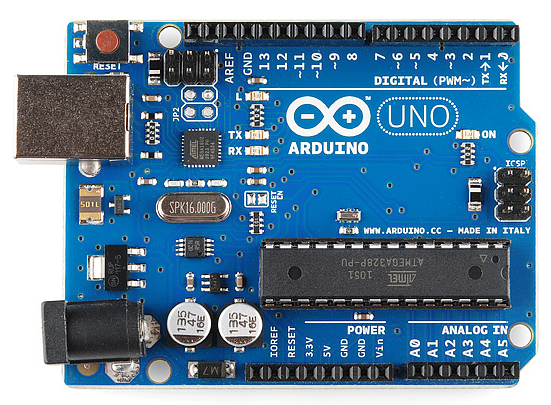 One of the most popular Arduino boards out there is the Arduino Uno. While it was not actually the first board to be released, it remains to be the most actively used and most widely documented on the market. Because of its extreme popularity, the Arduino Uno has a ton of project tutorials and forums around the web that can help you get started or out of a jam. We’re big fans of the Uno because of it’s great features and ease of use. we give the opportunity to have an excellent copy of Genuine Arduino at a nifty price and e guaranty the performance of our product . this is a complete technical overview of Arduino as components and MCU Before we can understand the UNO's hardware, we must have a general overview of the whole system first. After your code is compiled using Arduino IDE, it should be uploaded to the main microcontroller of the Arduino UNO using a USB connection. Because the main microcontroller doesn’t have a USB transceiver, you need a bridge to convert signals between the serial interface (UART interface) of the microcontroller and the host USB signals. The bridge in the latest revision is the ATmega16U2, which has a USB transceiver and also a serial interface (UART interface). To power your Arduino board, you can use the USB as a power source. Another option is to use a DC jack. You may ask, “if I connect both a DC adapter and the USB, which will be the power source?” The answer will be discussed in the “Power Part” section from this article. To reset your board, you should use a push button in the board. Another source of reset should be every time you open the serial monitor from Arduino IDE. 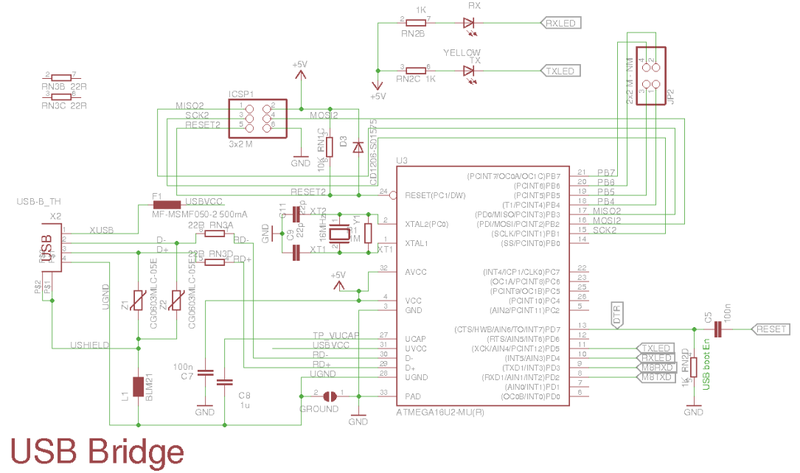 we redistributed the original Arduino UNO schematic to be more readable below.we advise you to download it and open the PCB and schematic using Eagle CAD while you are reading this article. 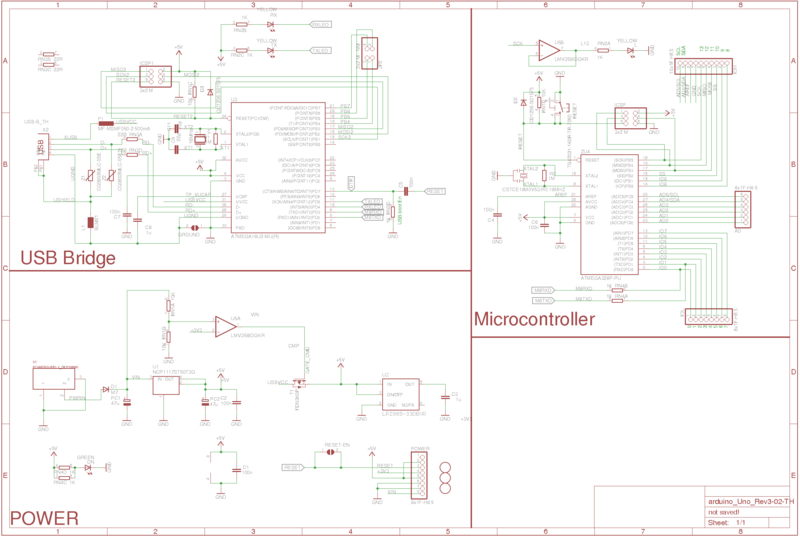 Redistributed version of the original Arduino schematic. Click to enlarge. 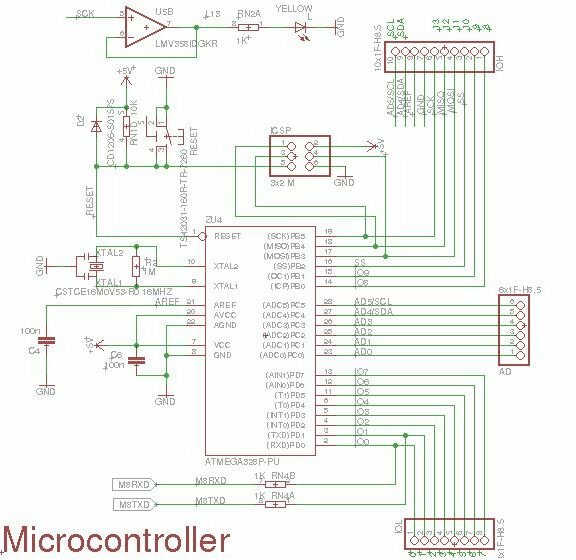 It is important to understand that the Arduino board includes a microcontroller, and this microcontroller is what executes the instructions in your program. If you know this, you won't use the common nonsense phrase "Arduino is a microcontroller" ever again. The ATmega328 microcontroller is the MCU used in Arduino UNO R3 as a main controller. ATmega328 is an MCU from the AVR family; it is an 8-bit device, which means that its data-bus architecture and internal registers are designed to handle 8 parallel data signals. Flash memory: 32KB nonvolatile memory. This is used for storing application, which explains why you don't need to upload your application every time you unplug arduino from its power source. SRAM memory: 2KB volatile memory. This is used for storing variables used by the application while it's running. EEPROM memory: 1KB nonvolatile memory. This can be used to store data that must be available even after the board is powered down and then powered up again. This MCU is a DIP-28 package, which means that it has 28 pins in the dual in-line package. These pins include power and I/O pins. Most of the pins are multifunctional, which means that the same pin can be used in different modes based on how you configure it in the software. This reduces the necessary pin count, because the microcontroller does not require a separate pin for every function. It can also make your design more flexible, because one I/O connection can provide multiple types of functionality. 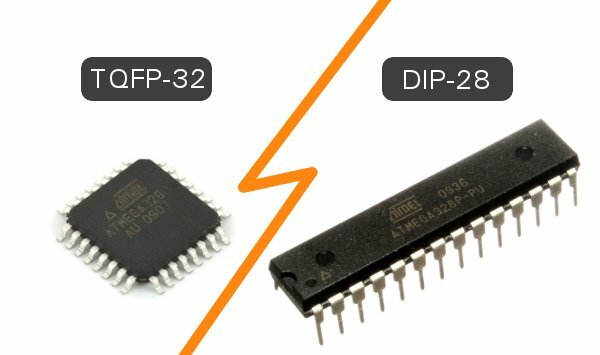 Other packages of ATmega328 are available like TQFP-32 SMD package (Surface Mount Device). Two different packages of the ATmega328. Images courtesy of Sparkfun and Wikimedia. The MCU accepts supply voltages from 1.8 to 5.5 V. However, there are restrictions on the operating frequency; for example, if you want to use the maximum clock frequency (20 MHz), you need a supply voltage of at least 4.5 V.
This MCU has three ports: PORTC, PORTB, and PORTD. All pins of these ports can be used for general-purpose digital I/O or for the alternate functions indicated in the pinout below. For example, PORTC pin0 to pin5 can be ADC inputs instead of digital I/O. There are also some pins that can be configured as PWM output. These pins are marked with “~” on the Arduino board. 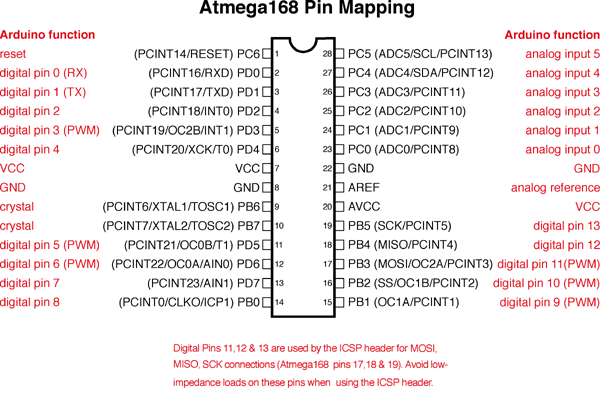 Note: The ATmega168 is almost identical to the ATmega328 and they are pin compatible. The difference is that the ATmega328 has more memory—32KB flash, 1KB EEPROM, and 2KB RAM compared to the ATmega168's 16KB flash, 512 bytes EEPROM, and 1KB RAM. ATmega168 pinout with Arduino labels; the ATmega168 and ATmega328 are pin compatible. Image courtesy of Arduino. 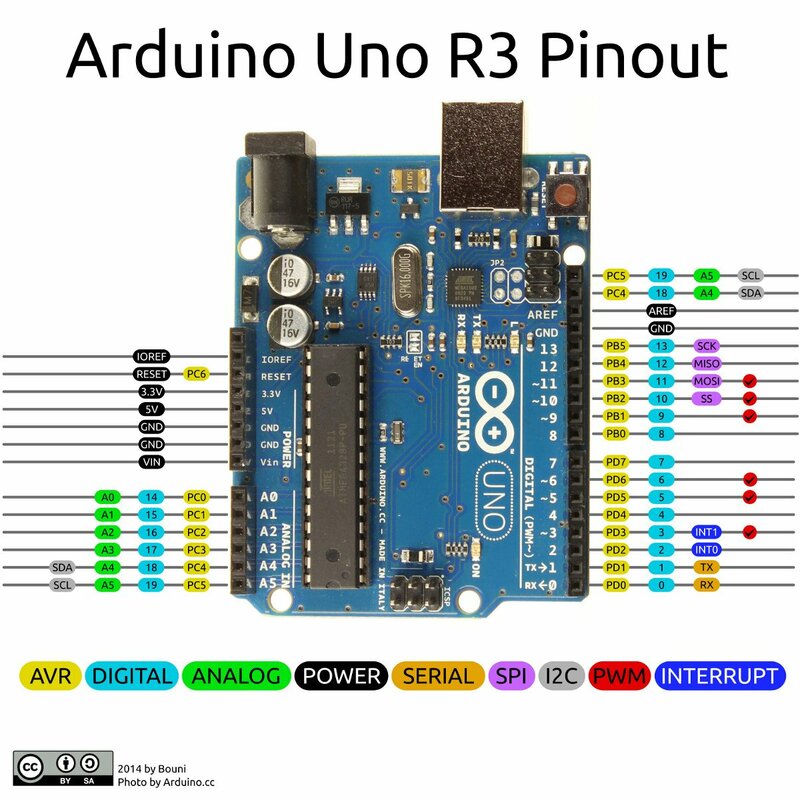 Arduino UNO R3 pinout. Image courtesy of GitHub. 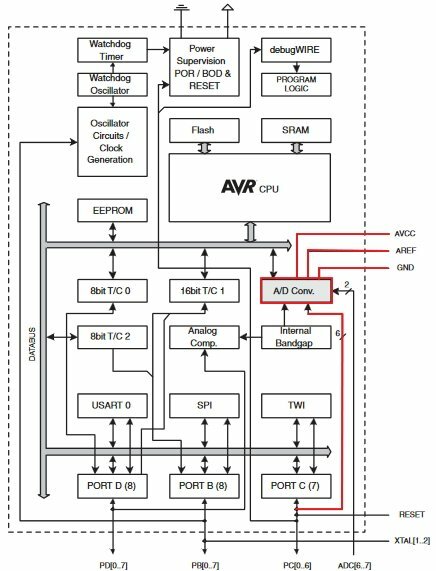 This MCU has six channels—PORTC0 to PORTC5—with 10-bit resolution A/D converter. These pins are connected to the analog header on the Arduino board. One common mistake is to think of analog input as dedicated input for A/D function only, as the header in the board states ”Analog”. The reality is that you can use them as digital I/O or A/D. AVCC: The power pin for the A/D unit. AREF: The input pin used optionally if you want to use an external voltage reference for ADC rather than the internal Vref. You can configure that using an internal register. Internal register settings for selecting the Vref source. A UART (Universal Asynchronous Receiver/Transmitter) is a serial interface. The ATmega328 has only one UART module. The pins (RX, TX) of the UART are connected to a USB-to-UART converter circuit and also connected to pin0 and pin1 in the digital header. You must avoid using the UART if you’re already using it to send/receive data over USB. The SPI (Serial Peripheral Interface) is another serial interface. The ATmega328 has only one SPI module. The I2C or Two Wire Interface is an interface consisting of only two wires, serial data, and a serial clock: SDA, SCL. You can reach these pins from the last two pins in the digital header or pin4 and pin5 in the analog header. Other functionality is included in the MCU, such as that offered by the timer/counter modules. You may not be aware of the functions that you don't use in your code. You can refer to the datasheet for more information. Arduino UNO R3 MCU part. ATmega328-PU: The MCU we just talked about. IOL and IOH (Digital) Headers: These headers are the digital header for pins 0 to 13 in addition to GND, AREF, SDA, and SCL. Note that RX and TX from the USB bridge are connected with pin0 and pin1. AD Header: The analog pins header. 16 MHz Ceramic Resonator (CSTCE16M0V53-R0): Connected with XTAL2 and XTAL1 from the MCU. Reset Pin: This is pulled up with a 10K resistor to help prevent spurious resets in noisy environments; the pin has an internal pull-up resistor, but according to the AVR Hardware Design Considerations application note (AVR042), “if the environment is noisy, it can be insufficient and reset may occur sporadically.” Reset occurs if the user presses the reset button or if a reset is issued from the USB bridge. You can also see the D2 diode. The role of this diode is described in the same app note: “If not using High Voltage Programming it is recommended to add an ESD protection diode from RESET to Vcc, since this is not internally provided due to High Voltage Programming”. The capacitors give high-frequency noise signals a low-impedance path to ground. 100nF is the most common value. PIN13: This is connected to the SCK pin from the MCU and is also connected to an LED. The Arduino board uses a buffer (the LMV358) to drive the LED. ICSP (In-Circuit Serial Programming) Header: This is used to program the ATmega328 using an external programmer. It’s connected to the In-System Programming (ISP) interface (which uses the SPI pins). Usually, you don’t need to use this way of programming because bootloader handles the programming of the MCU from the UART interface which is connected using a bridge to the USB. This header is used when you need to flash the MCU, for example, with a bootloader for the first time in production. Arduino USB bridge part. Click to enlarge. As we discussed in the “Arduino UNO System Overview” section, the role of the USB-to-UART bridge part is to convert the signals of USB interface to the UART interface, which the ATmega328 understands, using an ATmega16U2 with an internal USB transceiver. This is done using special firmware uploaded to the ATmega16U2. From an electronic design perspective, this section is similar to microcontroller section. This MCU has an ICSP header, an external crystal with load capacitors (CL), and a Vcc filter capacitor. Notice that there are series resistors in the D+ and D- USB lines. These provide the proper termination impedance for the USB signals. Z1 and Z2 are voltage-dependent resistors (VDRs), also called varistors. They are used to protect the USB lines against ESD transients. The 100nF capacitor connected in series with the reset line allows the Atmega16U2 to send a reset pulse to the Atmega328. The 5V regulator is the NCP1117ST50T3G and the Vin of this regulator is connected via DC jack input through the M7 diode, the SMD version of the famous 1N4007 diode (PDF). This diode provides reverse-polarity protection. 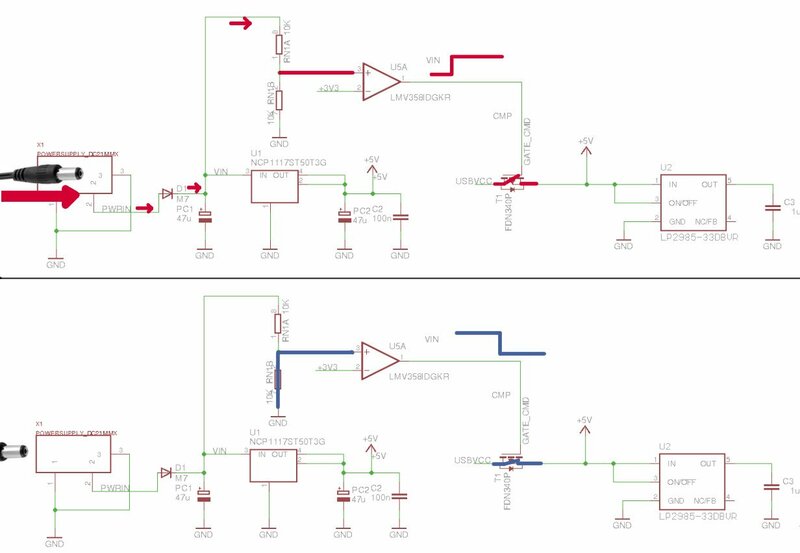 The output of the 5V regulator is connected to the rest of 5V net in the circuit and also to the input of the 3.3V regulator, LP2985-33DBVR. You can access 5V directly from the power header 5V pin. Another source of 5V is USBVCC which is connected to the drain of an FDN340P, a P-channel MOSFET, and the source is connected to the 5V net. The gate of the transistor is connected to the output of an LMV358 op-amp used as a comparator. The comparison is between 3V3 and Vin/2. When Vin/2 is larger, this will produce a high output from the comparator and the P-channel MOSFET is off. If there is no Vin applied, the V+ of the comparator is pulled down to GND and Vout is low, such that the transistor is on and the USBVCC is connected to 5V. Power source switching mechanism. Click to enlarge.